The Wolf 36 Inch Duel Fuel Range With Griddle: Worth It? Don't Miss Our Product Updates & New Posts, Sign Up Here! Porterhouse Steak: What Is It Again? Wolf makes three outstanding 36 inch dual fuel ranges. This article will focus on the 36 inch range with the infrared griddle (the DF364G). The oven in the DF364G is Wolf’s largest and most powerful electric oven. Wolf is one or maybe is the most iconic brands in the pro range industry. If you’ve been looking at the 30 inch duel fuel range and wondering what options may come with a larger sized range, read this review to find out. You can use the table of contents below to skip to what you might be most interested in or just read through the article below. Is A Wolf Range Worth The Price? What Are Double Stacked Burners? What Is A Wolf Infrared Griddle? What Are Some Of The Things Wolf Doesn’t Talk About? What About Dual Convection, The Temperature Probe And The Control Panel? How Big Is The 36 Inch Range Oven? What Else About The Oven? Wolf was founded by the Wolf brothers in the 1930’s in Los Angeles as a commercial range manufacturer. It later became an iconic brand in the home and has maintained that distinction after its acquisition by Sub-Zero. More details on the history of Wolf and the Wolf brand can be found here in the Wolf range product guide. You may be wondering whether the Wolf ranges, including the DF364G, are worth the price. Wolf designs their ranges to last for 20+ years. You have to consider the likely cost per year over at least 20 years versus any other range options. Other brands may be cheaper but are not likely to last nearly as long. You have to add replacement costs for these other ranges when comparing to Wolf. If you a cheaper brand range only lasts five years, then how many of these ranges would you would have to buy over 20 years? You also have to consider the important design element that a Wolf range adds to your kitchen. Given the prestige of the Wolf brand, this range will make a big statement in your kitchen, whether you’re focused on that or not. If you never cook or never plan to cook, then you might want to consider something more basic (unless it’s for your in-house chef!). But if you do cook and or even plan to cook for at least a couple decades, then you have to seriously consider a Wolf range. The four sealed double stacked burners in the DF364G range vary in power. 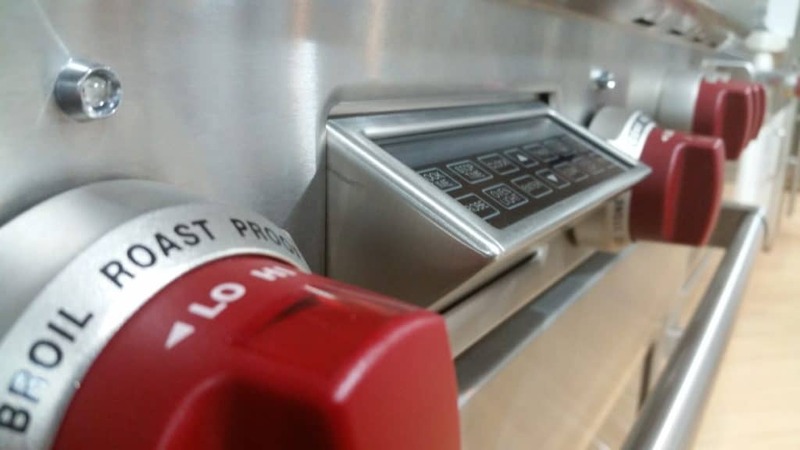 The lowest rated burner is 9,200 BTUs (and this lowest burner includes a “melt” mode). This burner is great for melting chocolate or simmering delicate sauces. The other burners are rated at 15,000, 18,000 and a very powerful 20,000 BTUs. The 20,000 BTU burner is certainly powerful enough to sear almost anything. There are higher rated burners from other manufacturers up to 25,000 BTUs and some have open burners. But realistically, most cooks don’t need that much power at home and open burners are a little less safe if any kids are around your kitchen. Each burner also includes automatic re-ignition. If the burners happen to blow out from a rare draft in your house or even a gust of wind, the burners will re-light themselves. You may not even notice if it happens, but it’s nice to know that you won’t have to worry about unlit gas spreading through your kitchen! Like other Wolf ranges, the DF364G is fully convertible to propane gas from natural gas. The double stacking of the burners means these burners have two rings of flame ports for the burner’s gas jets. They are stacked on top of one another to produce high heat when you need it. Alternatively, you can just engage one ring of jets (the bottom of the two stacked burner rings) to create a low simmer if that’s what you’re after. The burners are easily controlled by turning each control knob to the left for “Lo” temperature setting, when one row of flames is engaged. Or, turn the knob to the right for the “Hi” to engage both flame rings. These are Wolf’s famous red burner knobs that come standard. You can also now choose stainless steel or black knobs if you’d prefer. Wolf burners are some of the best simmer burners in the “pro style” range category, with consistent simmers. Other brands produce low temp simmers by turning off and on. Wolf does not. The Wolf infrared griddle uses a 15,000 BTU burner and integrated radiant plate to evenly spread heat to the griddle surface. The large surface area will give you a lot room on the rangetop. It is equivalent to the area on the range otherwise occupied by two burners. You can think of it as a super large pan to use to evenly cook about anything you’d cook with your pans and cookware. You can even use cookware on the griddle. The griddle also features a removable reservoir in the front of the griddle. The reservoir is designed to contain any cooking residue that may otherwise escape. The griddle also includes a cover designed to enclose your griddle when it’s not in use. An optional accessory for the Wolf griddle is a specially fit eleven inch all maple wood cutting board. It fits in the griddle in place of the griddle cover. 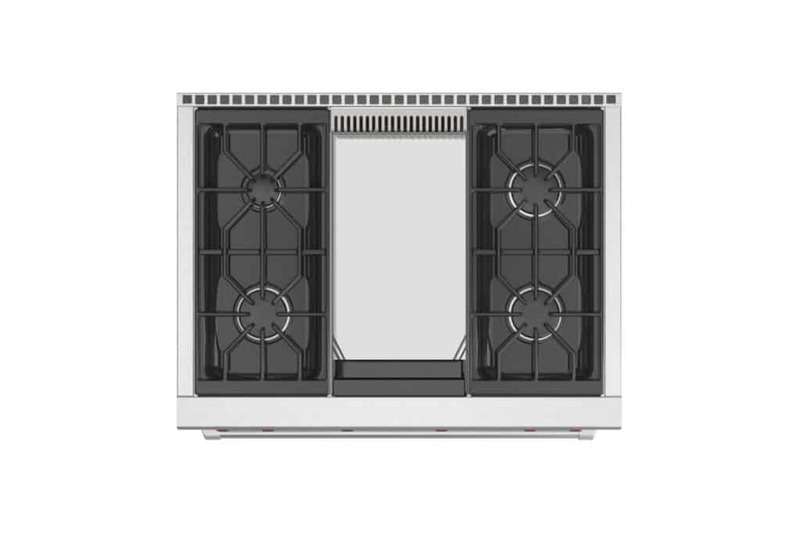 One of the most important design elements of the Wolf 36 inch electric oven are the dual convection fans. Each fan has its own integrated heating element. The oven also has an 8-pass 4,000 watt infrared broiler. The other oven element is actually a two-element system consisting of an inner and out element. The inner element is rated at 1,000 watts and the outer element is rated at 1,200 watts at 240 amps. Wolf doesn’t really detail the power of the heating elements or how many passes the broiler elements have, but it’s good to know. These high powered, high pass elements are part of your range and you need to know their power before you make your purchase! The dual convection fans will spread oven heat or ambient air consistently and evenly around the inside of your oven. This helps to prevent “cold spots” or uneven temperatures. It’s not fun to find that your food is rare, raw or not at all done on one side and fried, scorched or crisp on the other. The infrared broiler will produce a restaurant quality sear on your favorite cut of meat. Or, you can just add a final crispy texture to your food. The integrated temperature probe works with your oven controls to tell you when you food is cooked. You won’t have to guess when the probe tells you the internal temperature of your roast. All you have to do is enter the target temperature for whatever you’re cooking. You may want to check guidelines for each type or cut of meat for recommended “doneness”. 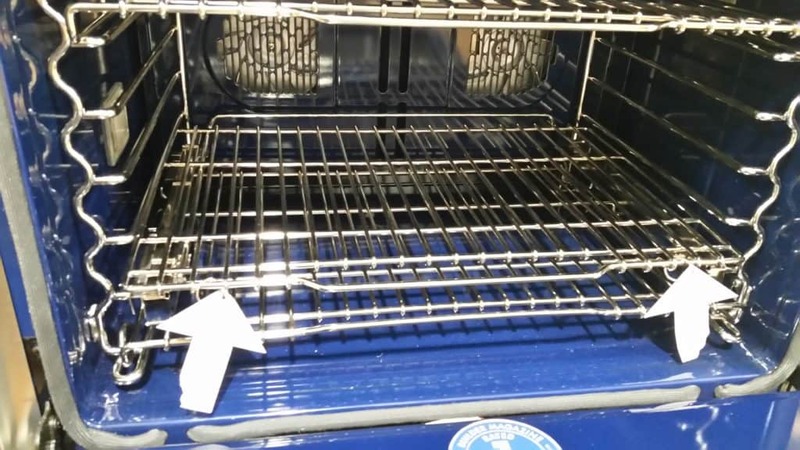 The oven control panel pivots out of the oven when you need it. When you do, it pops out to set the oven temperature, the timer to delay cook or cook for a certain period. You may even choose not cook at all if you engage the Sabbath mode (this oven is Star K compliant). When you’re done with your settings, you can choose to pivot the control panel into the range and no one will know its there. The 36 inch range electric oven is the largest electric oven that Wolf makes. It has 3.5 cubic feet of usable oven space when you deduct racks and other oven components. 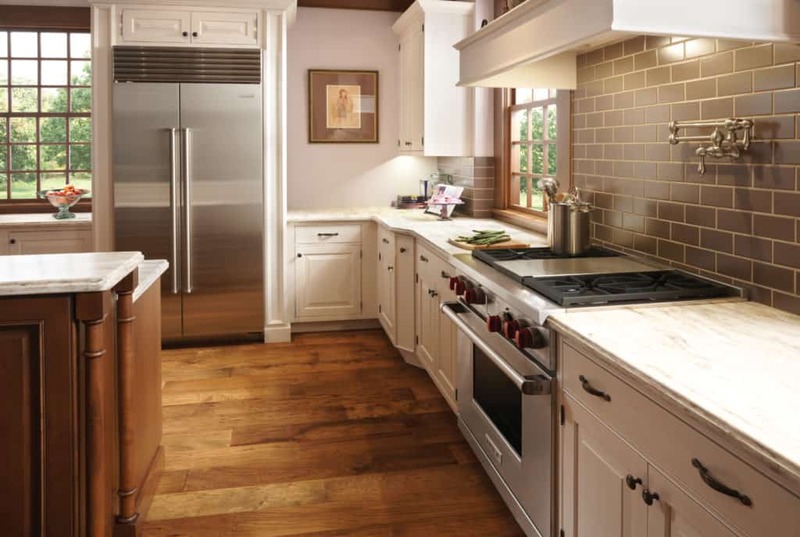 When measuring the cavity of the oven itself as other manufacturers do, it measures over 5.4 cubic feet. This is how other manufacturers describe their interior oven space if you are comparing brands. The interior measures 30 inches wide, big enough for commercial sized cookie sheets! It is 16 ½ inches high and 19 inches deep. You may be also interested to know that the smallest oven that Wolf makes is its 1.1 cubic foot countertop oven. The countertop oven is very useful as an extra oven that will do everything this large 36 inch oven will do. Read all about it here in this comprehensive review. The oven settings include multiple cooking modes. These are: convection, convection bake, convection broil, convection roast, bake, broil, roast, bake stone, proof (for making yeast based bread), dehydrate and self-clean. Each mode works by setting temperatures, fans and time to tackle a variety of cooking methods. Dehydrate may be new to you. It uses the convection fan to preserve fruits,vegetables and meat by removing almost all of the water in these foods. You can even use this mode to make beef jerky. You may even save enough food by dehydrating it to pay for your oven over the 20-plus years you are likely to own this range! The self clean mode uses all the oven heating elements at full power to basically burn up any cooking residue in the oven. The cleaning mode can be set for either three or four hours (you can interrupt it anytime you need to). Also, you’ll notice that your oven interior is a pretty cobalt blue. That is Wolf’s porcelain coating. 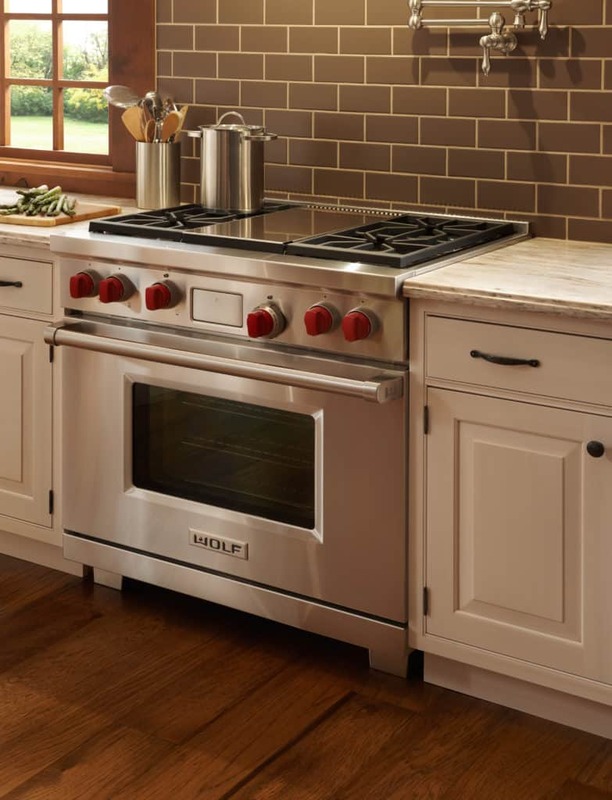 It is an important finish that will help to maintain your oven’s interior over multiple cooking cycles. The oven door is also triple-paned for long life durability. There are five rack positions, three racks are included. One of those racks is a full extension rack. The oven also features two halogen lights for ample visibility. Also important to note, the DF364G weighs about 470 pounds. The Wolf warranty is limited for up to five years. Details can be found here in the table of contents for the Wolf range product guide. Well that’s up to you, but if you need a big oven with maybe the best quality “build” in the industry, you should seriously consider the Wolf DF364G. Like all Wolf products, you need to think about them as an investment, not just as a purchase. You’ll be using them for a long part of your life. If you don’t cook often or don’t think you need a “pro-style” range like this one, then consider an alternative, lower cost range. There are plenty of lower cost ranges that will do the job. They just won’t last as long. Want To Make Something Special And Unexpected For Your Guests? New Kitchen Life is a participant in the Amazon Services LLC Associates Program, the Amazon EU Associates Programme and the Amazon Associates Program, which are affiliate advertising programs designed to provide a means for sites to earn advertising fees by advertising and linking to Amazon.com, Amazon.co.uk and Amazon.ca. New Kitchen Life is also a participant in other affiliate advertising programs. These programs allow New Kitchen Life to earn advertising or other fees from linking to sites that sell products on some of these web pages. New Kitchen Life is paid by the seller and not from anyone buying products on this site.